The north access point of Monterey SB, is west of Hwy 1. Take the Hwy 218 (Seaside) exit. Proceed west to parking lot. The south end is accessible west of the intersection of Figueroa St & Del Monte Av. Effective September 16, 2014, California State Parks is banning beach fires on state beaches within the Monterey District to minimize any fire dangers. The state beaches affected by this order include Carmel River, Monastery and Monterey. State Park officials will begin issuing warnings immediately to first-time offenders. All illegal fires will immediately be put out and repeat offenders will be issued citations. For the purposes of cooking, a raised and self-contained gas camp stove may be used. High fire danger and very little rain this summer, along with the continued degradation of our beaches due to charcoal and soot deposits from beach fires, requires us to rescind our order allowing beach fires. We sincerely apologize for any inconvenience, but we are taking these steps to ensure public safety and to protect California’s natural resources. California State Parks officials are rescinding a Superintendent’s Posted Order that allows beach fires without restrictions at the three state beaches mentioned above, and will begin enforcing California Code of Regulations T14 4311(a) which states, "No person shall light, build, use or maintain a fire within any State Park Unit except in a camp stove or a fireplace provided, maintained, or designated by the Department for such purpose". Other measures recently taken to reduce the risk of wildfires include the US Forest Service and California State Parks banning any wood or charcoal burning fires in the Los Padres Forest or Big Sur in late August. State beaches are areas with frontage on the ocean, or bays designed to provide swimming, boating, fishing, and other beach-oriented recreational activities. This beach is a favorite place for surfers and tidepool watchers. Fishing is popular, too. The cities of Monterey and Seaside share the park, which has three separate beaches approximately a mile apart. The underwater area of the park attracts scuba divers. Visitors also enjoy kayaking, kite-flying and volleyball. The flat beach is an excellent place for beachcombing. The park is located at the Seaside exit off Highway 218, west of Highway 1. Dogs are not allowed at Monterey State Beach North of the Monterey Beach Resort hotel. 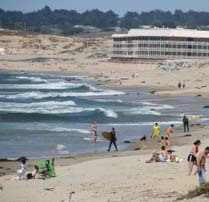 Dogs on leash are allowed at Monterey State Beach South of the Monterey Beach Resort hotel. Dogs on leash are allowed at Asilomar State Beach, Carmel River State Beach, and Garrapata State Park. For Weddings and Special Events, call 831-624-3407 or e-mail the Special Events Coordinator.